Azure Gold Line Premium Flavored Tobacco hit the hookah around 2017 and made its impression almost immediately; it's an impression that is most likely here to stay and for good reason. Azure is praised by enthusiasts everywhere for the overall accuracy of the flavor profiles and the sheer innovation behind the blends that they provide that can't be found anywhere else. Of course, the brand originates from Russia where Hookah smoking is a lifestyle and not just a hobby. 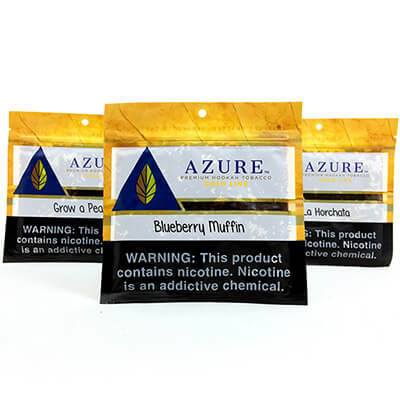 Azure Gold Line has a truly unique variety to choose from and their 100 gram pouches allow for Hookah users to sample what Azure Hookah Tobacco has to offer. This size is packaged in a plastic bag that is sealed for freshness. 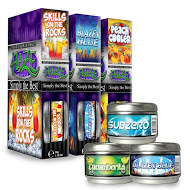 This package is resealable and recommended for shisha storage. Azure Gold Line is a blonde leaf medium choppy cut hookah tobacco and is undyed with a natural brown coloring. It is moderately juicy and produces the best results when using a semi-fluff to normal pack in a phunnel bowl. Always mix up your tobacco to redistribute the juices and then sprinkle it in producing a fluff pack. If you prefer a little more density, then use your thumb and index to lightly drop in the tobacco up to the rim but not over. 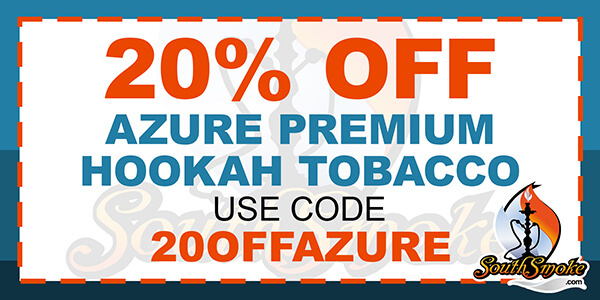 Azure takes heat really well so don't be hesitant to start with 3 hookah coals and work your way up accordingly depending on the size of the hookah bowl you are using.